With the negative sign showing to the right of the number. This is a post by Scott Rosenbaum of Innovent Solutions. It does not necessarily reflect the view of any of the other BIRT project members. One of the things that I often get asked is how does BIRT compare to BrandX? For the last six years, I have been creating solutions using BIRT, so the easy answer would be just use BIRT. Unfortunately it is not that simple. So how does BIRT compare to BrandX? requires a bit more than just use BIRT. Most of the answer depends on the business issue that we are trying to solve. But we also have to evaluate if BrandX has reached the point of being sufficiently mature. Over the last three years three open source business intelligence and reporting projects have emerged as leaders. BIRT, JasperReports, and Pentaho dominate the open source business intelligence and reporting space. In my opinion, BIRT reached the minimum maturity level with its 2.2 release in 2007, since then the product has continued to mature through three annual releases (2.3, 2.5, 2.6). So what about Jasper and Pentaho, how do their features compare to BIRT, and are they sufficiently mature? In an effort to come up with a better answer, Innovent Solutions has conducted a product comparison of the open source report development tools from each project. The full evaluation is available on the the Innovent Solutions web site (free, no registration). The starting point for the product comparison can be found at Product Comparison Overview. If you are interested in specific comparisons, we have one for BIRT versus Jasper and another for BIRT versus Pentaho. We also created a side by side feature comparison the Open Source Comparison Matrix (BIRT, Jasper, Pentaho). NOTE: I would love to hear what you think of the Innovent comparison, but I would like to keep the focus of this blog on BIRT. For this reason I have turned off comments for this post. Comments about the comparison should be made from the Product Comparison Overiew page on the Innovent Solutions web site. The advanced BIRT Roadshows will begin next week in Boston, New York and DC. These events feature a free day of training on advanced BIRT topics, like understanding the event model, chart and report item scripting, implementing high performance reports, and making BIRT mobile. The schedule for the month of September is listed below. If you are interested, sign up quickly, as space is limited. BIRT has many ways to include images within a report. Images can be used in BIRT styles, as watermarks, in text elements, and placed within the report using an image report item. 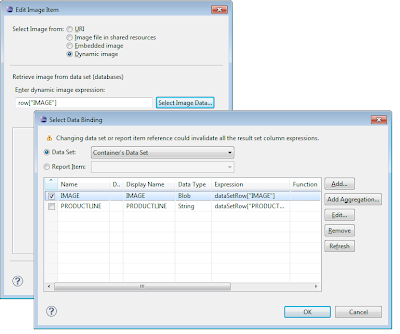 In this post I will cover some of the details needed to work with images that are inserted using the Image report item. This expression checks the value of the dynamicimage report parameter, and then based on its value, sets the value of the URI. 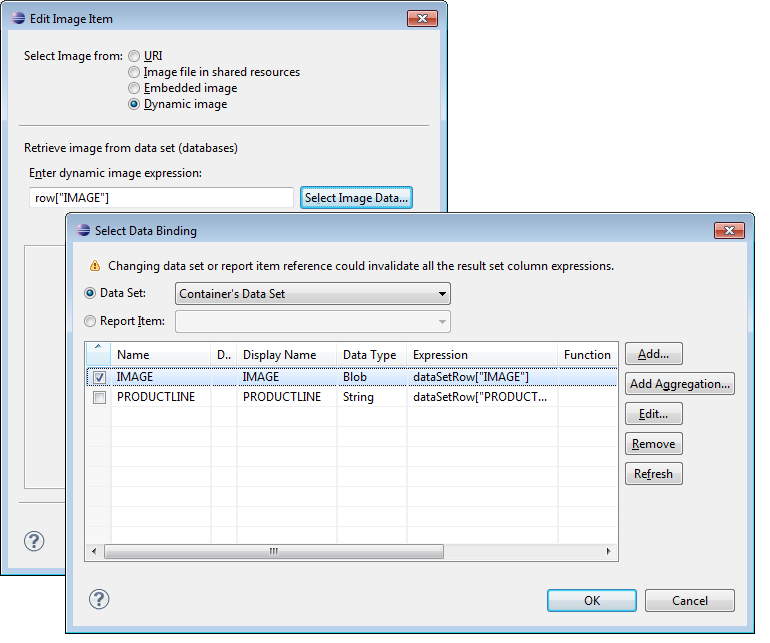 This expression checks the row data to determine which resource folder image should be rendered. The same type of checks can be made if you are using the onCreate script event for the image element. One thing to note in the above is that the column value QUANTITYORDERED is the binding column name, not the dataset column name. See the binding tab on the table in the attached example. Images can also be placed in jar files within the resource folder. If your image exists in a jar file, you can use a script expression similar to the following to specify the image to retrieve. 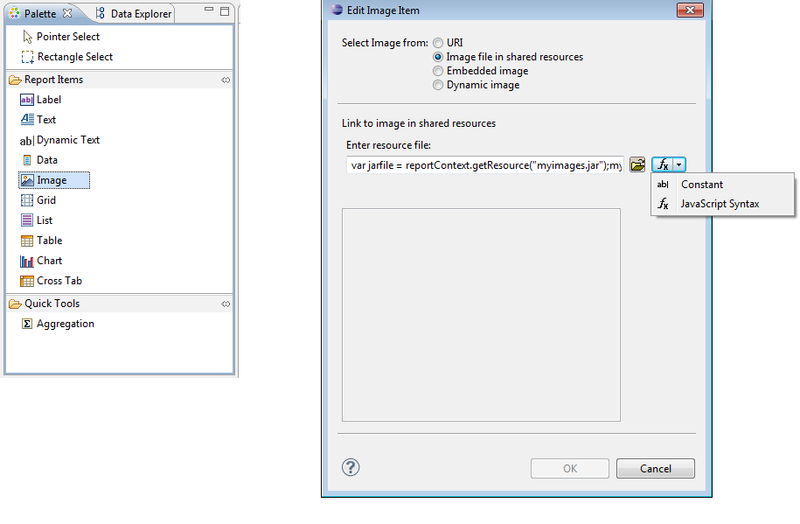 The getResource method of the reportContext object is used to return the location of a file in the resource folder. Using the location of the file and the jar protocol, the image can be specified. BIRT allows images to be encoded directly into the xml report design. Images can be added by right clicking on the embedded images icon in the outline view of the report and selecting “New Embedded Image”. After selecting the image, the outline view is updated and the data for the image is encoded in to the design. You can also add embedded images to the report using the add image button of the image report item editor. 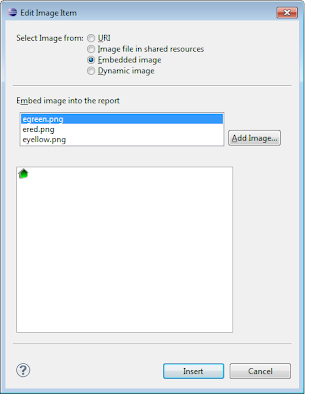 Once the images are embedded into the report, you can add the image report item to the desired location, choose the embedded image radial, select the image name and click the insert button. If you wish to change the image dynamically, this can be done using an onCreate script. In the onCreate script specify the image name using the imageName property. Dynamic images allow Blob images to be inserted into the report. Typically this type of image is tied to a data set column through either the image’s dataset bindings, or the container element’s bindings (eg Table). The sample database, which is delivered as part of BIRT, contains a Blob type column in the PRODUCTLINES table. The example report used in the post has an example of using this column in conjunction with the image report item. A developer can also use an onCreate event script to set the image data. When doing this, the image data should be in a byte. 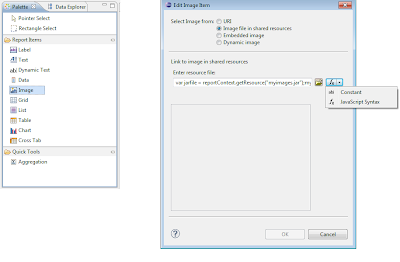 Presented below is an onCreate script that uses the ImageIO class to read a file, a URL, an image from the resource folder, or an image in a jar file in the resource folder. Uncomment the section of the script for the desired image location. The example used for this post is available at Birt-Exchange. To setup the example, copy the birtimages.jar and the three supplied images to your resource folder.